$1 will be donated to the Stop Bullying Now Foundation for all pledges received. Over 3.2 million students are the victims of bullying each year in America. 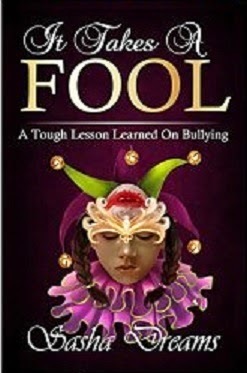 Sasha Dreams has included a pledge to end bullying in every paperback copy of It Takes A Fool. $1 will be donated to the Stop Bullying Now Foundation for every pledge received. Life couldn't be sweeter for ten year old Sasha... Sasha lives the good life and is the darling of her fifth grade class. Suddenly, her father loses his job, sending Sasha and the rest of her family into a downward spiral filled with drugs, disappointment, and disaster. To cope, Sasha empowers herself by bullying her best friend whose kindness and empathy only enrage her more. Sasha's struggle with life, school, and failed dreams takes its toll in bouts of rage enacted on anyone who gets in her way--even her sister. It isn't until she commits the ultimate act of unmerited vengeance against her best friend that she learns the truth. Will it be too late for Sasha to make things right?